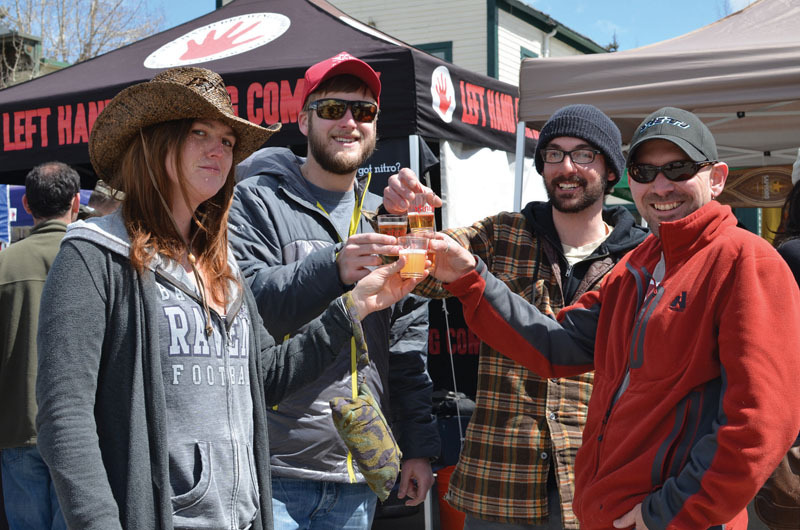 With 32 breweries and upwards of 100 beers to try at last weekend’s Breckenridge Beer Festival, it was hard to select a few shining stars. Different palates gravitate toward different styles, so here’s a range of delicious offerings that had me coming back for seconds (or thirds) throughout the day. I used this beer to bribe a few friends into helping me pack up a moving truck recently, but after cracking a can, I regretted sharing. I was happy to see it poured at the beer festival and didn’t hesitate to get another taste. This pale ale is brewed with coriander for a slightly fruity citrus aroma and flavor followed by a big, hoppy hit. Upslope won its first medal for this beer in 2009 at the Great American Beer Festival when the brewery was only 10 months old, and it’s been unleashed in a limited release for us to enjoy all over again. Jimmy Walker at Breckenridge Brewing Co. created this peppery IPA for Colorado Craft Beer Week and saved a bit for the beer-hungry hordes at the Breckenridge Beer Festival. The vast majority of chili beers start with a lighter base, a lager or a light ale, which allows the chili flavor to blast through without much support. Choosing an IPA as the base makes for a more complex, aromatic beer with the same great smoky-hot hit. If you see Jimmy around town, let him know that this beer is fantastic and add your voice to my request that he brew it again in the summer. It would pair great with barbecue or burgers and a sunny day on the Breck Brewery patio. I tried this beer for the first time at a beer dinner at the Vail Ale House before revisiting it at the Breck Beer Fest. The dinner featured a whole lot of courses paired with a whole lot of beers, and this was the culminating pint. The brew was infused into the whipped cream that topped a chocolate espresso panna cotta, and the combination of that dish and that beer created the most lovely sugar rush to end a big meal. This seasonal stout is dark, rich and malty, with a strong chocolate flavor and a hint of mint. Imagine making soup out of Thin Mint cookies and straining them into a can, and you end up with Vernal Menthe. It’s definitely a sipping beverage, and one or two cans would be enough to sate all but the most severe sweet tooth. Boulevard wasn’t actually pouring 80 Acre at the beer festival. I know this column is dedicated to high points of that event, and I could write at length about my love for one of Boulevard’s flagship beers, the Unfiltered Wheat, which they were pouring. But this beer is so bright and beautiful that I had to plug it here. I tried this beer for the first time on the Front Range, but Patrick Brady, Colorado sales rep for Boulevard, said 80 Acre should be appearing on a few taps around the county in the near future. This beer is a hybrid of an IPA and a wheat, with a hoppy aroma and a smooth, effervescent mouth feel. You could call it a slightly sweet IPA or a lightly bitter wheat, but neither of those descriptions quite fits. It makes my mouth happy, and I’m excited for 80 Acre to having its coming out party in the high country very soon.